What is Pluto’s atmosphere like? It seems like I’ve been wondering about that for decades! We’ve known so little for so long about Pluto’s atmosphere – other than it’s low-pressure, made mostly of molecular nitrogen (with a little methane and carbon monoxide mixed in) and may be quite extended – it’s nice to realize that we’ll know a whole lot more after New Horizons visits in summer 2015. 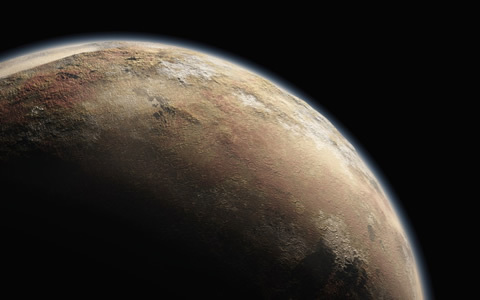 Artist’s impression of Pluto, with its wispy atmosphere. Data from New Horizons’ Alice ultraviolet spectrograph will answer a full range of questions about the composition and structure of that atmosphere. My professional interests on New Horizons lie with Pluto’s upper atmosphere – what it’s made of, how it interacts with space, and how it is processed by sunlight into different gases and aerosols. A problem in planning atmospheric observations for New Horizons during the flyby is that we really don’t know what to expect. Only a few models have been made that try to predict the composition of Pluto’s atmosphere, and they don’t agree very much with each other because of the many present uncertainties. So our plans generally include a lot of survey-type observations, where we try not to assume too much about what we will detect, but are ready for anything. The best example of this is the Pluto solar occultation observation. The Alice ultraviolet spectrograph will watch the Sun set (and then rise again) as New Horizons flies through Pluto’s shadow, about an hour after closest approach. Watching how the different colors of sunlight fade (and then return) as New Horizons enters (and leaves) the shadow will tell us nearly all we could ask for about composition (all gases have unique absorption signatures at the ultraviolet wavelengths covered by Alice) and structure (how those the absorption features vary with altitude will tell us about temperatures, escape rates and possibly about dynamics and clouds). When the New Horizons data start coming down, these are the data I’ll be waiting for the most! Randy Gladstone, of the Southwest Research Institute, leads the atmospheres theme group on the New Horizons Science Team. An expert in planetary aeronomy (studies of the upper atmosphere) and radiative transfer, he also serves on the Alice instrument team.